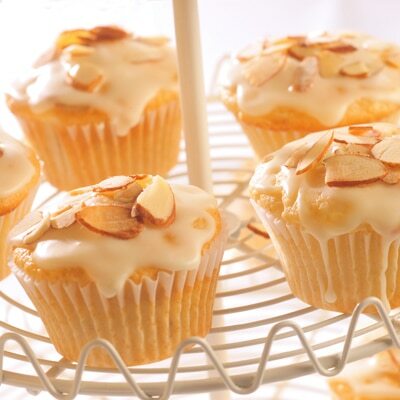 Toasted Almond Muffins have a wonderful combination or orange and almond flavors. They are great for breakfast or brunch and make a perfect snack or a light dessert too. PREHEAT oven to 375° F. Grease or paper-line 18 muffin cups. COMBINE baking mix, evaporated milk, granulated sugar, vegetable oil and egg in large mixer bowl. Beat on high speed for 30 seconds or until blended. Fold in 3/4 cup almonds. Spoon batter into prepared muffin cups, filling 2/3 full. BAKE for 15 to 18 minutes, or until wooden pick inserted in center comes out clean. Remove to wire racks to cool completely. COMBINE powdered sugar and orange juice in small bowl. Spread over each muffin; sprinkle with remaining almonds.